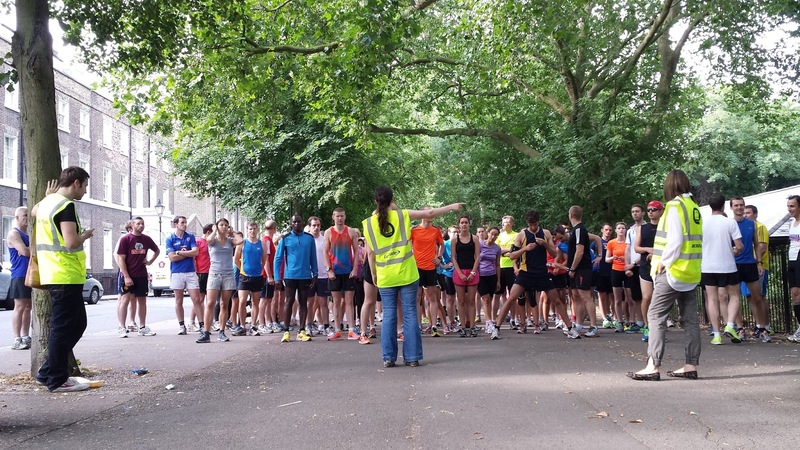 Last year I ran at this parkrun venue but it was an Olympic-themed special event on a Thursday afternoon. Because it was a special event parkrun HQ decided that it would be recorded as a bespoke venue, and while having a bespoke parkrun on my log is awesome, it does mean that Highbury Fields was never officially logged and I always knew that I'd have to come back to officially run the course. And what better time to do so than 1 year and 1 day after my original visit. This time I took the bike. 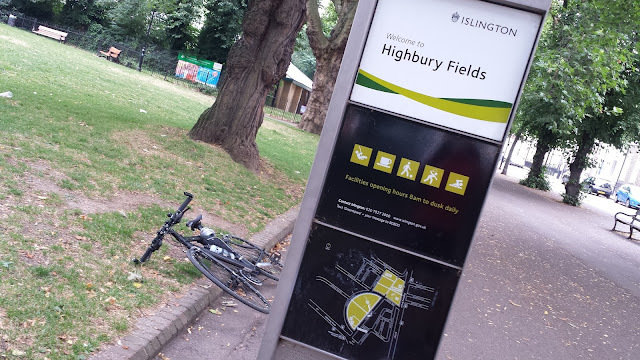 The main set of bike racks are at the entrance to Highbury pool and fitness centre (south west edge of the park) and there's one along the western perimeter. 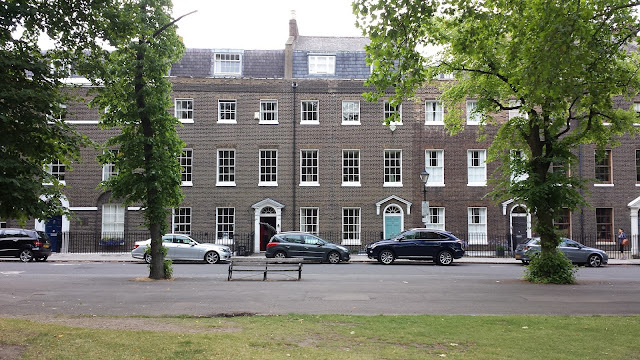 There are another couple of sets just on the southern junction where Highbury Crescent meets Highbury Place. It looked like most of the regulars felt comfortable leaving their bikes on the grass near the finish line. It is recommended that you do not bring your car as there is no car parking nearby and with such great transport links it makes perfect sense. 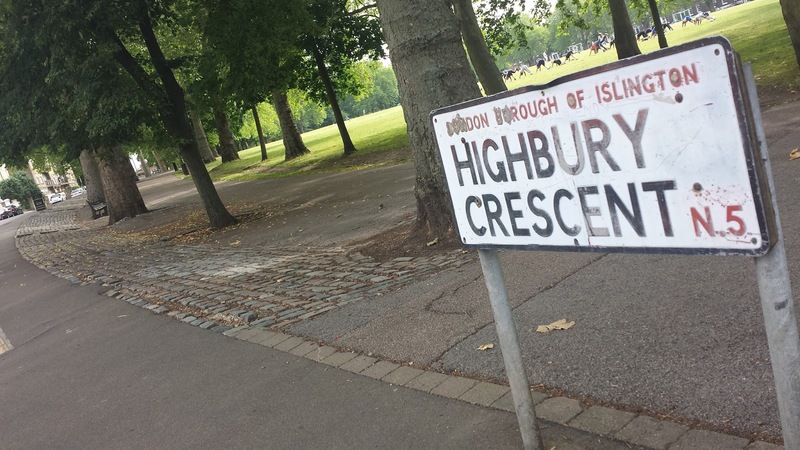 Highbury and Islington station is served by the tube, the overground and by mainline trains. There are loads of buses that pass through Upper Street and Holloway Road so I'm sure that would also be a pretty easy way to get here. Highbury Fields parkrun is special as it is a five-and-a-bit lap course - which means that unless you are a sub-20 runner you'll probably be lapped. I think it still holds the record for the parkrun with the most number of laps. The course is a back-to-front D shape (you can see it clearly in the first photo) and is run entirely on tarmac paths with the exception of the very last bit where you take a diversion onto the grass to run through the finish funnel. The course profile can be divided into three fairly equal parts. The start line to just after the first corner is slightly uphill, the curved part of the D is mostly downhill, and the part at the southern tip of the course is flat. So overall I'd say the course is ever so slightly undulating. 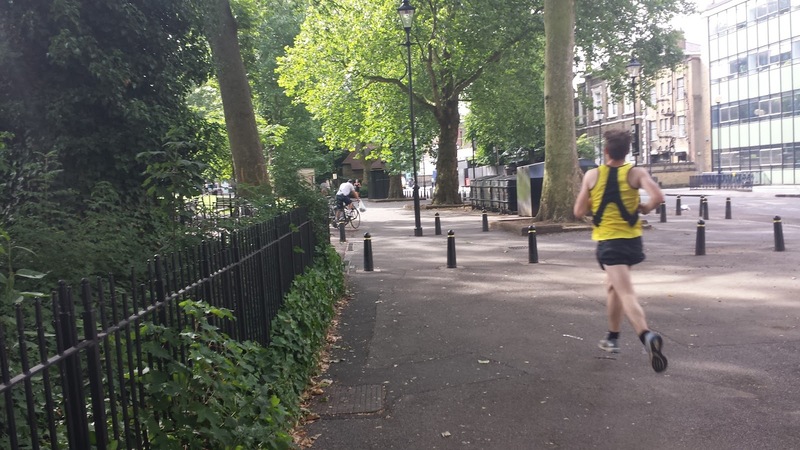 The run starts on the path adjacent to Highbury Place (near the rear of the pool building) and you run in an anti-clockwise direction around the perimeter path following Highbury Crescent all the way back round to Highbury Place. 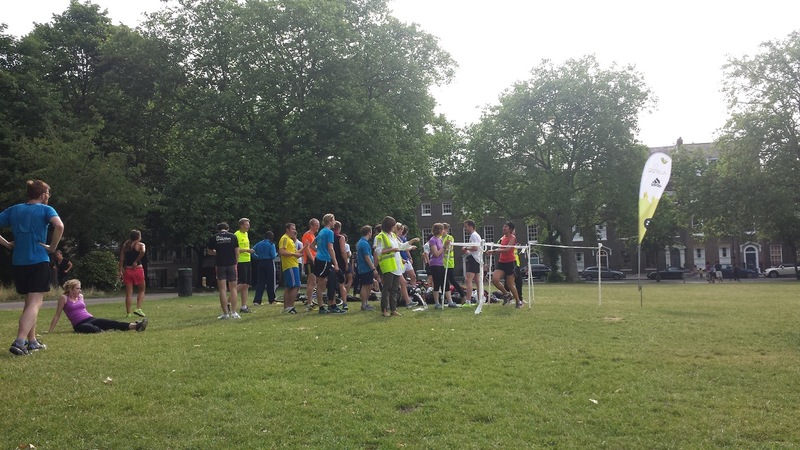 After completing five full laps you're left with a final few hundred metres to reach the finish line. 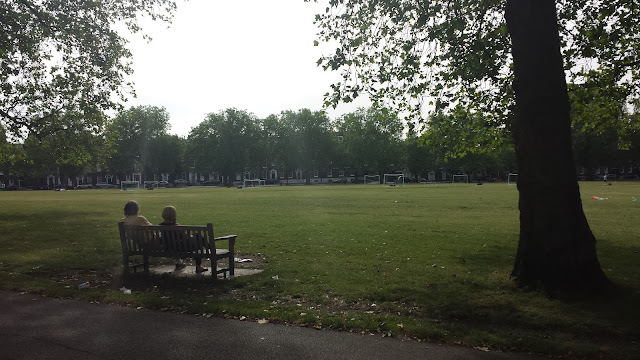 The fields are the largest open green space in the borough of Islington and are surrounded by 'highly desirable' Georgian and Victorian terraces. 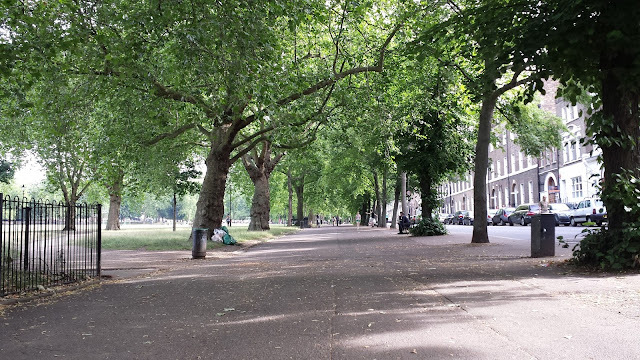 In the park you'll find the previously mentioned pool and fitness centre, tennis courts and a memorial to residents of Islington who fell in the Boer War. There's also a pretty large playground for the children. I have to admit that I wasn't expecting to be a fan of the five lap setup, but after thinking about it during my extended bike ride home I have come to the conclusion that it does have it's advantages - The most notable being that if someone comes along to cheer you on they get the opportunity to do so five times! 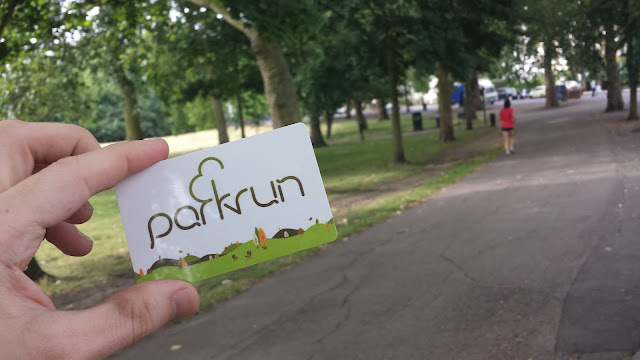 I also had the opportunity to try out one of my new parkrun barcodes, which I am happy to report scanned perfectly!